I’ve been elbows deep in cookies lately, if you haven’t noticed from my blog. So I decided it was time to have something a little healthy around here. When I was in Maui with my family last month, I had the BEST salad at the Pineapple Grill in Kapalua full of squash, toasted coconut, pomegranate seeds, quinoa and of course, dinosaur kale. As it was gluten-free, dairy-free AND vegan (not that I’m vegan but I do enjoy a good vegan meal) it really blew me away! 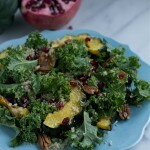 As soon as I got back, I knew it was one I had to attempt to recreate a pomegranate and squash kale salad at home! I (for some reason) had never thought of using toasted coconut before on my salad but now that I’ve tried it, it’s going to be difficult to resist putting it on all of my salads. I love the texture and the little bit of sweetness that it adds. Speaking of texture, this salad is full of it! The pomegranate seeds, the kale, the quinoa, the coconut – all great textures that really add to the overall meal. You’ll love this salad – especially topped with a great dressing. I like to keep my salads simple with some avocado oil, spices and herbs (mostly because me and vinegar don’t currently get along), but a vinaigrette would be absolutely divine on this salad! 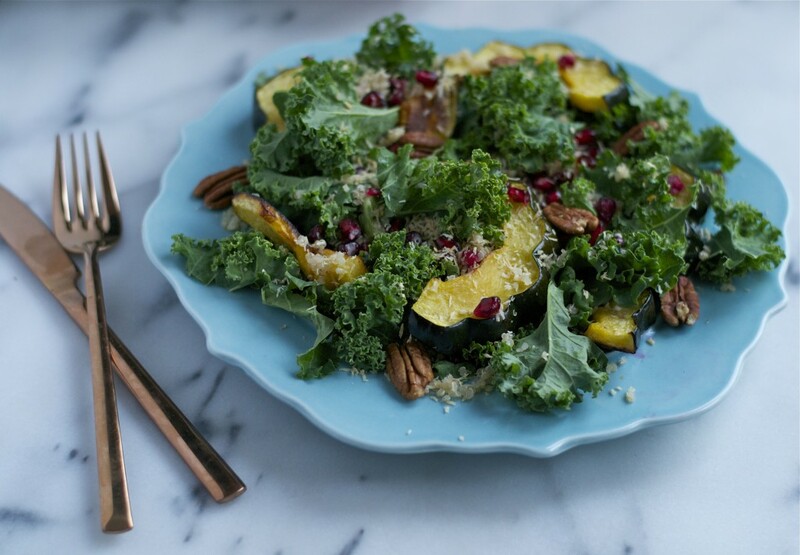 Next time you’re feeling a little blah from your cookie binge – it’s okay, we all do it 🙂 – try this pomegranate and squash kale salad. It’s even festive enough to serve for holiday meals! This pomegranate and squash kale salad is fresh and vibrant topped with toasted coconut and roasted pecans. Preheat large skillet over medium high heat. Add oil and heat. Sprinkle squash pieces with salt and pepper. Add to the skillet and cook for 4-6 minutes on each side, until they are lightly browned and soft. Set aside. In a small saucepan, add water and uncooked quinoa. Bring to a boil. Once boiling, reduce heat to low and cover with a pan. Cook for 15-20 minutes, until quinoa is cooked through and fluffy and the water is absorbed. In a small skillet over low heat, add unsweetened coconut. Toast coconut for 3-5 minutes, until light golden brown, making sure to mix with a spatula often so the coconut does not burn. 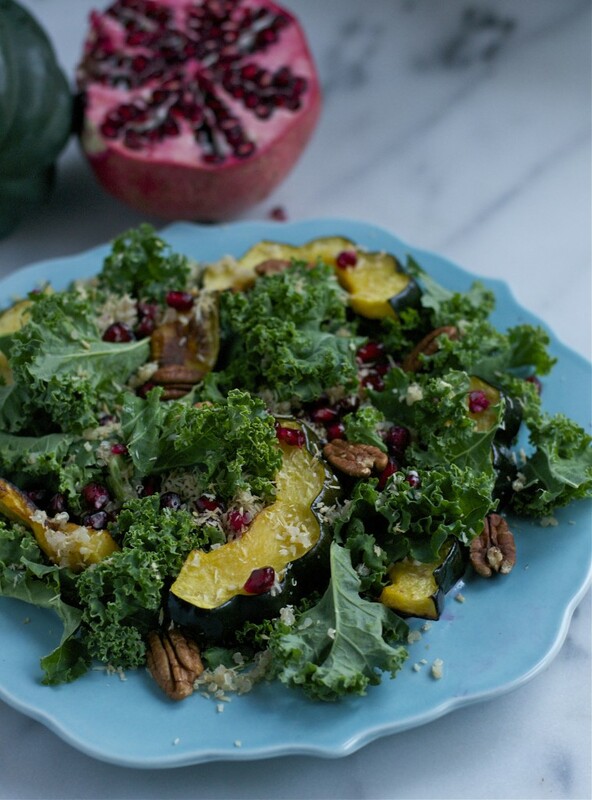 In a large bowl, toss together kale, pomegranate, acorn squash, coconut and quinoa until combined. Add a few extra pomegranate seeds on top for a festive look. I’m totally in the same boat as you— needed a little cookie detox— and made almost an identical salad the other day! Too funny! Love the idea of adding toasted coconut. I’ve never even thought to try that before. Thanks for sharing! I totally meant to tell you the other day when you posed yours that I had one for this week too! Too funny!! !